This is a conforming dress designed for my character "Amy for Aiko 3". - Full and Mini version can share the same texture. Runtime\libraries\character\Amy\Qipao\AmyQipao2.cr2 - Qipao2 in Poser cr2 format. Runtime\libraries\character\Amy\Qipao\AmyMiniQipao2.cr2 - Mini Qipao2 in Poser cr2 format. Runtime\Geometries\Amy\Qipao\AmyQipao2.obj - Qipao2 Model in OBJ format. Runtime\Geometries\Amy\Qipao\AmyQipao2.mtl - Material Library for Qipao2. Runtime\Geometries\Amy\Qipao\AmyMiniQipao2.obj - Mini Qipao2 Model in OBJ format. Runtime\Geometries\Amy\Qipao\AmyMiniQipao2.mtl - Material Library for Mini Qipao2. Templates\AmyQipao2Template.jpg - Template for texture. - Load Amy for Aiko3 character in Poser or DAZ|Studio. 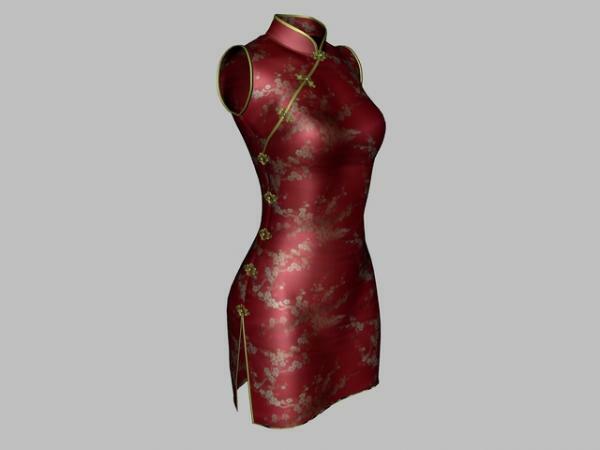 - Load AmyQipao2.cr2 or AmyMiniQipao2.cr2 in Poser or DAZ|Studio. The parts above the hip conformed to the target figure. The parts below the hip have to be posed manually. - It is tested with DAZ|Studio only. - It is designed for Amy for Aiko3 (October 25, 2007) release. It may work with other Aiko3 based characters. - Poser users may need to load the texture manually. If the dress doesn't fit after conforming, try to set the scale of the dress to 107.5%. ** Feel free to use for commercial and non-commercial art. ** Please do not redistribute in part of a package, for free or for sale. VIRUS230373 (5 years ago) Inappropriate? I'm working on the Genesis version. Still facing some difficulties. For V4 or V4.2, I did not have any success of making conforming clothing for V4 or V4.2. Thank you for this. Very nice. flickew (8 years ago) Inappropriate? Alexandre Genovese (11 years ago) Inappropriate? Elfwine (11 years ago) Inappropriate?